DIE Martis, 16 die Octobris. 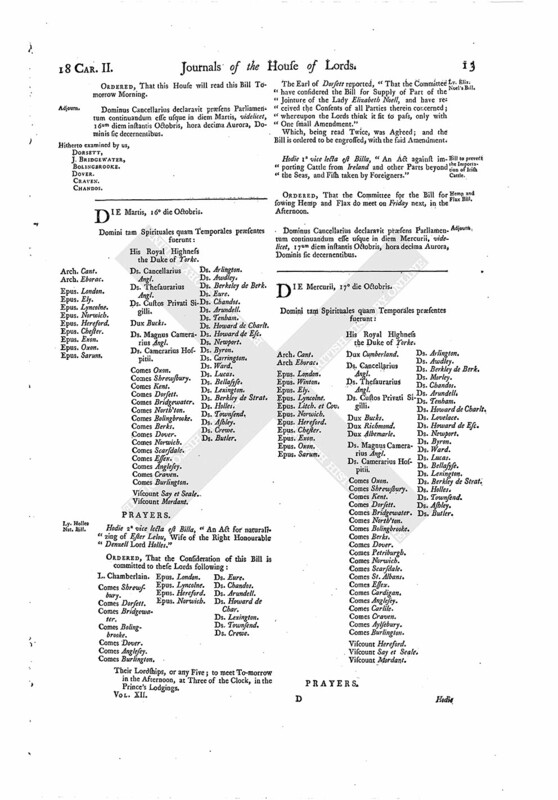 Hodie 2a vice lecta est Billa, "An Act for naturalizing of Ester Lelou, Wife of the Right Honourable Denzell Lord Holles." Their Lordships, or any Five; to meet To-morrow in the Afternoon, at Three of the Clock, in the Prince's Lodgings. The Earl of Dorsett reported, "That the Committee have considered the Bill for Supply of Part of the Jointure of the Lady Elizabeth Noell, and have received the Consents of all Parties therein concerned; whereupon the Lords think it fit to pass, only with One small Amendment." Which, being read Twice, was Agreed; and the Bill is ordered to be engrossed, with the said Amendment. Hodie 1a vice lecta est Billa, "An Act against importing Cattle from Ireland and other Parts beyond the Seas, and Fish taken by Foreigners." ORDERED, That the Committee for the Bill for sowing Hemp and Flax do meet on Friday next, in the Afternoon. Dominus Cancellarius declaravit præsens Parliamentum continuandum esse usque in diem Mercurii, videlicet, 17um diem instantis Octobris, hora decima Aurora, Dominis sic decernentibus.